Scenes rise before me "from boyhood's happy days. I'm thinking of the stone-fights, the tricks and games And plays. The days when we went swimming I was happy as a clam. The coppers how they'd chase us. but we didn't cure a d-m.
'Tis a mark from my angel mother's shoe-. Only a little scar, but how it made me dance. When the toe of her cowhide slipper just unroofed he seat of my pants. 'Tis a mark front my angel mother's shoe. She'd kick me full of knot-holes, of that I've lots of proof. My spinal column she'd paralyze according to the rules of Hoyle. And with me wipe the floor up, too, when she'd get full of oil. When she elevated her pedal extremity and tired her cow-hide hoot. 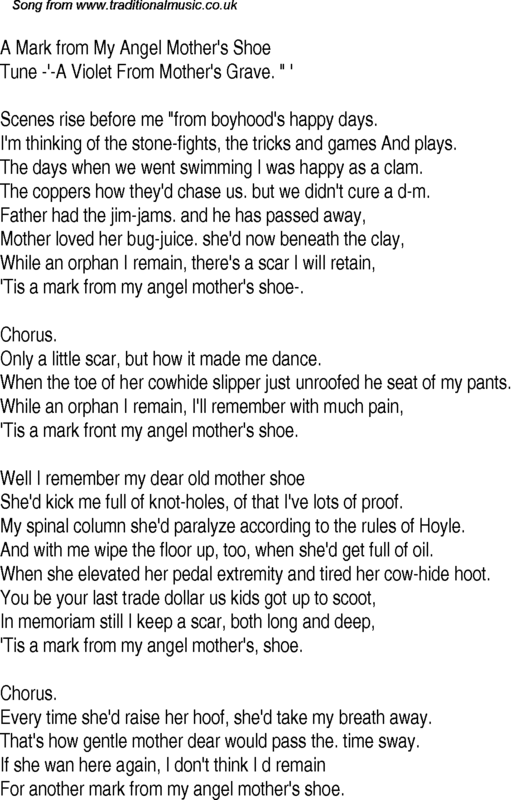 'Tis a mark from my angel mother's, shoe. Every time she'd raise her hoof, she'd take my breath away. That's how gentle mother dear would pass the. time sway. For another mark from my angel mother's shoe.